The Japanese restaurant Yumi at the Taj Samudra Colombo has released a new amazing promotion for the month of November. 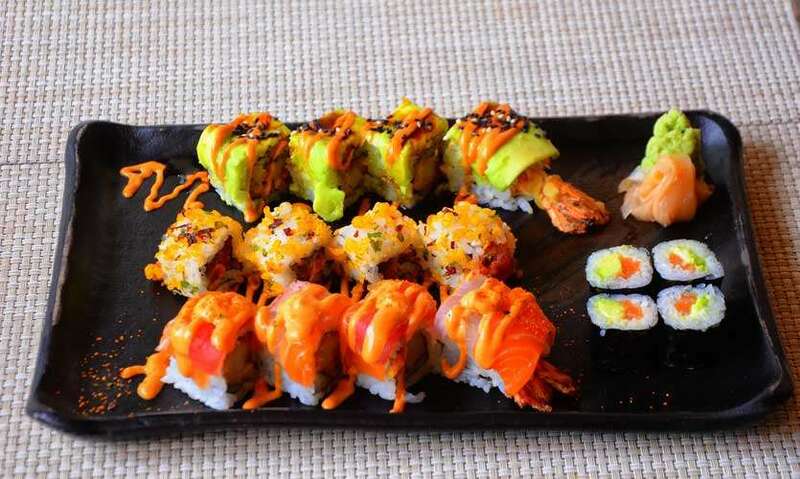 All you can eat Sushi for just Rs.3502. Yes, the price looks a bit steep, but I assure you there is no where in Colombo that has such an amazing deal, given the variety and the premium quality food offered! Yumi is one of the fancier Japanese restaurants that Colombo has to offer. The furniture and the interior are quite ‘chic’. 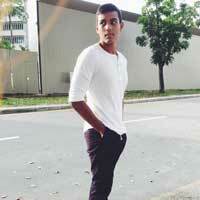 Its dark colours and not so bright lights gives off an almost romantic feel. 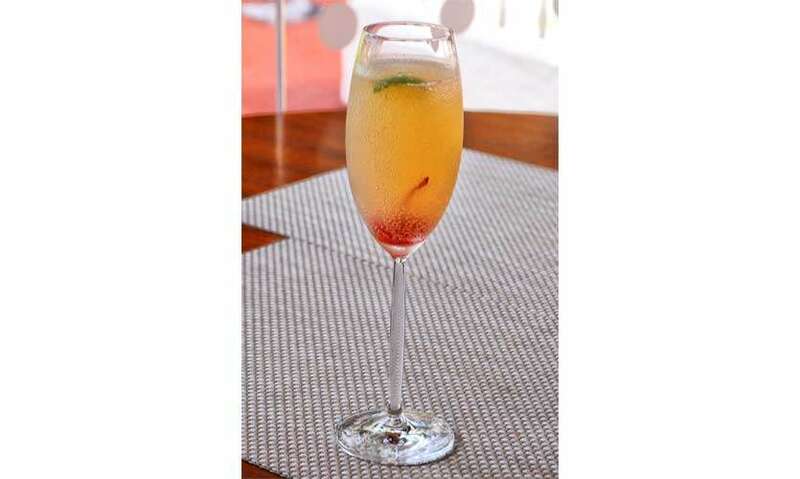 The Non-Alcoholic Fizz (Rs.700) their brand new drink, was honestly very interesting to say the least. It had lime, ginger beer and tabasco. I have never had that combination before and was at first a bit unsure. It’s very refreshing and the hint of spice from the tabasco tickles the back of your throat (in a very pleasant manner). All together this is a unique drink and a must try for those that love new things. How this promotion works is, they give you quite an extensive menu with a range of Sashimi, Maki and Nigiri. You get to choose 4 items at a time and once you are done with those 4 you can order more. 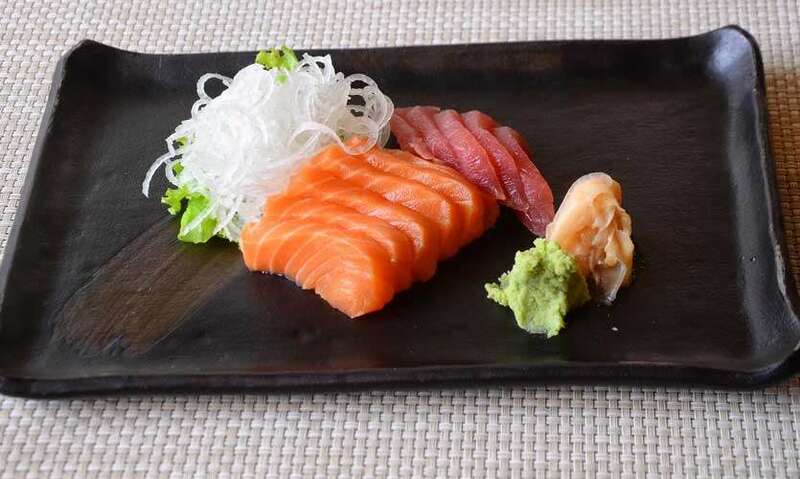 The menu has a wide variety of premium quality items, for example; the salmon is exported from Norway, and the tuna is export grade tuna and all the other ingredients used are but the finest of products. To start, we had a platter of various items, this included Rainbow Maki, Dragon Maki, Sri Lankan style Tuna Maki and Salmon and Avocado rolls. The Rainbow Maki was Tempura prawn with spicy mayo wrapped in rice with salmon sashimi on top, this was such a lovely treat. The crispy prawn, the delicious salmon and the spice all came together well. The Dragon Maki is tempura prawn wrapped in rice with avocado on top. I really liked the fact that the prawn was still warm and the rice and avocado were cool so the difference in temperature and flavour was truly YUMI! The Sri Lankan Style Tuna Maki was spicy tuna wrapped in rice with crunchy pieces on top. The salmon and avocado rolls are pretty self explanatory. The next platter had the Volcano Maki and Prawn and Salmon Nigiri. 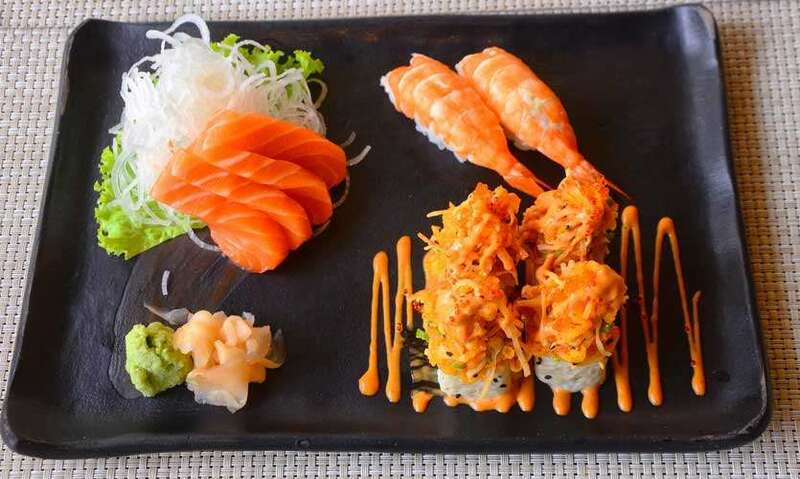 The Volcano Maki is a fan favorite and one of their top sellers,.This had a crunchy prawn and spicy mayo, wrapped with a soy wrap and on top was crab meat with the chef's special sauce. This lived up to its name and was truly an explosion of flavours in my mouth. The Prawn and Salmon Nigiri was very fresh and of course apart from the excellent products used, was nothing out of the ordinary. Next was the high quality Salmon sashimi. This just melted in our mouths and was wow! The final dish in the four that were ordered was the Chef's Special Salad, This had chunks of salmon and tuna mixed with a secret sauce, crab sticks and Lettuce. This was quite good, the sauce gave the dish added flavor. 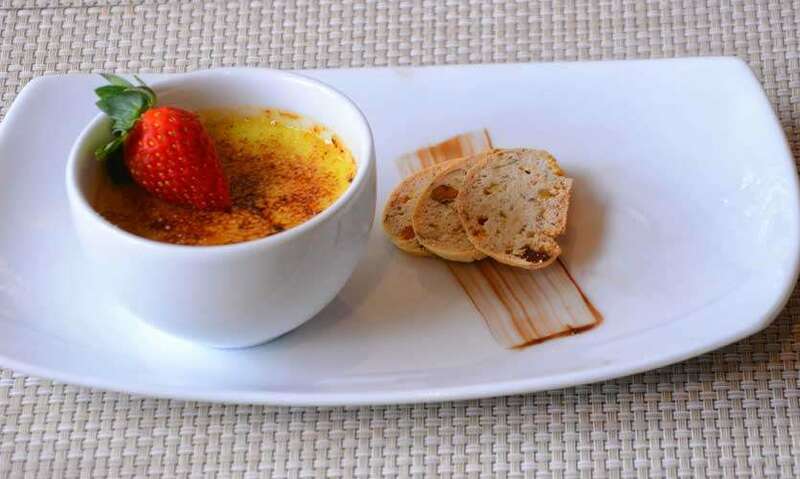 For Dessert, we had Wasabi Crème Brule (Rs.500). I know what your thinking wasabi in a dessert? Yup! It was actually pretty good; the wasabi gave the already great crème brule a new twist. This promotion is actually really good! The food was exquisite! And for that price, considering the restaurant and the cuisine, since Japanese is generally expensive. Technically there is no real catch! But there was one thing that got me questioning. That is the fact that you can only order 4 items at a time, and it takes a bit of time for an order to actually be brought to the table. The service is pretty good. The staff are friendly, helpful and food doesn’t take too long to come. For this deal, definitely! Well of course not often due to the price. My personal favorites were the Volcano Maki and the Rainbow Maki. Also, the Non-Alcoholic Fizz is a must try.